For instance, despite the World Health Organization (WHO) saying that the tobacco epidemic is one of the biggest public health threats the world has ever faced, killing more than seven million people a year, we need local actions to translate evidence-based tobacco control policies into public health impact. Non-communicable diseases (NCDs) such as cardiovascular diseases (CVDs) like heart disease and stroke, cancers, diabetes, chronic respiratory diseases, etc cause over 70% of deaths worldwide. While there are larger policy level changes and actions warranted, there is no excuse not to scale up well-coordinated responses on the ground to prevent NCDs. 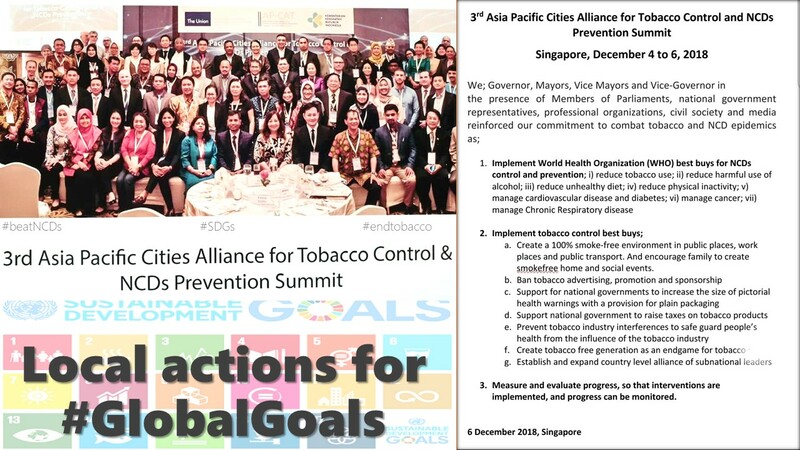 With this intent, 3rd Summit of Asia Pacific Cities Alliance for Tobacco Control and NCDs prevention (AP-CAT) brought together over 100 local leaders from 30 cities in 12 countries of Asia Pacific region. Participants included Members of Parliaments (MPs), Mayors, Vice Mayors, Governor, Vice Governor, other local government officials, public health experts, among others. Barrister Shameem Haider Patwary, Member of Parliament from Bangladesh (watch video interview, listen to podcast) said that when he attended the World Conference on Tobacco or Health (WCTOH) in Mumbai, India (2009), the writing on the wall was clear: tobacco is the single largest preventable manmade epidemic. "Since it is preventable, then why are we not making every effort to prevent it?" he said. "I have engaged in many litigations against tobacco companies" said Barrister Shameem Haider Patwary. He fought litigations against tobacco cultivation on the hill tracks, tobacco advertisement related issues, among others. "When I came to politics, I created my own manifesto to work against tobacco and tobacco companies as a politician. I came to know that large number of youth are getting addicted to tobacco. Youth are also the key targets of tobacco companies to make youth their future [business] and lifelong customers" said Barrister Shameem Haider Patwary. "Bangladesh is a country of 160 million people with children and youth who will be our future tomorrow. If we can make this world tobacco-free and beat NCDs, today's youth will be tomorrow's citizens of a healthy nation" rightly said Barrister Patwary. Barrister Patwary has conducted couple of mobile courts for tobacco control and is also engaging farmers to encourage them for crop substitution. "We will give them subsidy if they abandon tobacco cultivation. Corn is very popular in Bangladesh so we are encouraging them to cultivate corn rather than tobacco" he said. Local leaders are more in direct contact with the people. Whereas Members of Parliaments spend significant part of their time in the parliament and parliamentary processes and proceedings. For good governance it is vital that MPs work closely in tandem with local leaders who are more rooted in the community they represent. "That is why we are working closely with Union Parishad chairman, Union Parishad members, local Sabha members, and other local leaders, as they play a key role in convincing people who elect them to lead healthier life, stop tobacco use, and reduce risk of NCDs. Without their collaboration no policy can be achieved. My ultimate aim is to declare some of the areas of my constituency as completely tobacco-free" said Barrister Patwary. MPs can also support local leaders in amplifying their demands. "For example if local sabha member wants to promote NCDs prevention we can help promote that issue in the parliament or we can write to the ministry to help support the local leaders like Mayor who want to work on NCDs prevention, or make a park for people to do physical activity, or run awareness campaigns" said Patwary. He shared another way to help strengthen voices of local leaders: "Parliamentary Standing Committee is a very powerful committee on health or other issues. Parliamentary committee has parliamentarians as members and it can make recommendations. Good thing is that when a parliamentary committee makes a recommendation it is reviewed every three months, and it is almost binding for the ministry to follow these recommendations." 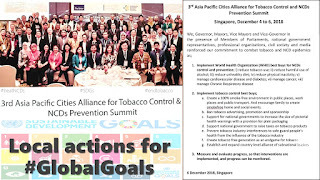 WHO has recognized tobacco industry interference as major obstacle in implementing global tobacco treaty (formally called the WHO Framework Convention on Tobacco Control) as well as, tobacco use as a threat to sustainable development. That is why the global tobacco treaty has WHO FCTC Article 5.3 to empower governments of over 180 countries to stop tobacco industry interference in health policy. Barrister Patwary shared that like in Japan, Bangladesh too, significant number of shares in tobacco company are owned by the government itself. This is the biggest problem why we lag behind in implementing WHO FCTC Article 5.3, says Patwary. "This creates a serious question of bias, lobby, interference... and also government cannot decide against the interest of tobacco company when itself it is a part of tobacco company." "We impose 1% surcharge on all tobacco products and we are advocating that this surcharge money should be used for prevention of NCDs" informed Barrister Patwary. Referring to progress made on WHO FCTC Article 19 which will empower governments of over 180 countries to hold tobacco industry liable, financially and legally, he commented that we need a far advanced legal framework if we are to hold tobacco companies liable for the damage they have caused. He said "we need some sort of funding for litigation in our country and alliance of lawyers so that lawyers get encouraged to do probono litigation against tobacco companies" to hold them to account for violations and abuses. There is strong evidence that catastrophic health expenditure is not only a major barrier in accessing existing healthcare services but also pushes healthcare seekers in deeper poverty. Catastrophic health expenditure is defined as out-of-pocket spending for healthcare that exceeds a certain proportion of a household's income with the consequence that households suffer the burden of disease. "In Bangladesh also, biggest procrastination in development is the health or medical cost. If any family member gets a heart disease or stroke or cancer (all NCDs), entire lifesavings are spent over his or her treatment. Health economists have also recognized catastrophic health expenditure as biggest cause of poverty and obstruction to development" said MP Barrister Shameem Haider Patwary. Prevention cannot take a backseat, especially when diseases that can be prevented are overburdening our health systems, and cause over two-thirds of untimely deaths. "If we take preventive measures like making safer spaces to walk or public parks for increasing physical activity we can reduce the risk of NCDs as well as save avoidable cost on healthcare. If we invest some of the funds for health promotion, so that more people are encouraged to use parks, walkways, gymnasiums, eventually we will end up making our people healthier and reducing overall health expenditure in the country" said Barrister Patwary. "In my constituency, there is no park. Besides the river we have a big vacant land where a park is being made from the funds given by me from my allocation. In 15 Unions (governance units), my ultimate aim is to establish 15 gymnasiums, 15 sports centres and 15 public parks. Women in the village often do not have space to walk and so certain time will be allocated only for women everyday to use the park, so that they can walk, see the nature, meditate, and exercise, comfortably" shared Patwary. Strong evidence shows that the tobacco industry and the deadly impact of its products cost the world’s economies more than US$ 1.4 trillion annually in healthcare expenditures and lost productivity. It is not a coincidence that around 80% of the world's 1.1 billion smokers live in low- and middle-income countries, but major tobacco companies and industries are headquartered in the richer nations. No prizes for guessing that it is the low- and middle-income countries that are reeling under the severest impact of NCDs too. Barrister Patwary agrees. "There is a mindset problem we have in top politicians that tobacco companies give high tax." More advocacy needs to be done to expose these misconceptions and recognize tobacco use as not only a threat to public health but also to nation's development and economy. "In last parliament, Bangladesh government had passed a law, Communicable Diseases Prevention Act. When I spoke about it, I had categorically said that we not only need that law for communicable diseases but we also need a guideline, central policy, trust or dedicated statute for non-communicable diseases (NCDs). Government has taken a note of it and working on it. We also have a National Health Policy where NCDs are reflected" shared Patwary. Nepal's Member of Parliament and former Health and Population Minister Khagaraj Adhikari said (watch video interview, listen to podcast) that all local lead-actors need to unite to translate these global goals into effective action towards desired change. Well-coordinated local leadership is central to effective implementation of health and development policies. Local actions are the fundamental building blocks to drive nations, regions and the world towards sustainable development. "We have to make agenda at provincial level, central level and local level leadership is key for implementation. With concerted efforts at all levels, Asia Pacific region will become tobacco-free in coming days", said Adhikari. Nepal has demonstrated strong leadership in tobacco control. Nepal had world's biggest pictorial health warnings (90%) on all tobacco products till very recently, when Timor Leste went for even bigger pictorial warnings (92.5%) pictorial warnings on tobacco packs. Nepal's contribution to tobacco control also got acknowledged with an international award. One of the awardees for 2015 Award for Global Tobacco Control of Bloomberg, was Nepal Ministry of Health and Population. 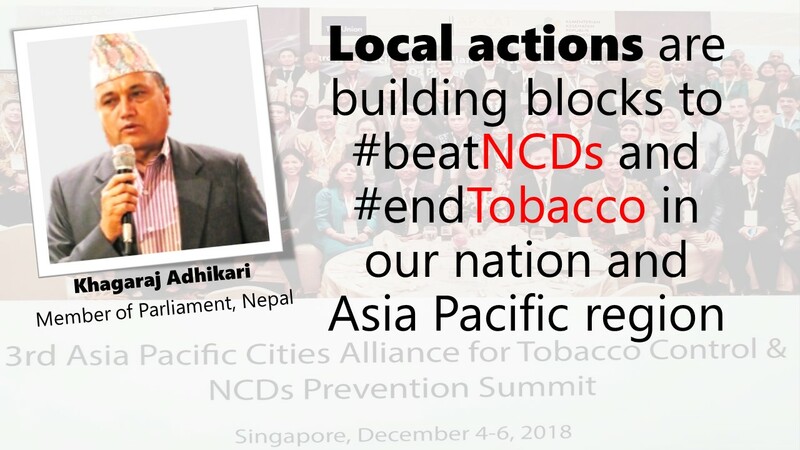 This Award citation in 2015 had put this on record: "Nepal has taken the lead among Southeast Asian nations when it comes to controlling and reducing tobacco use. 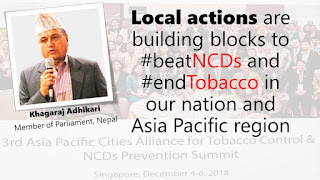 Initiated by the Ministry of Health and Population in 2011, Nepal has enacted a comprehensive law comprised of large graphic health warnings, comprehensive bans on tobacco advertising and sponsorships, as well as a smoke-free law for public spaces - all while facing immense pressure from the tobacco industry. To date, the Ministry of Health has faced 16 extensive court cases brought against the measure by the tobacco industry. Unbowed, the Ministry of Health and Population has won 14 of those cases, with two appeals currently pending." MP Khagaraj Adhikari shared that he was exposed to tobacco smoke as his father was a chain smoker. 12 years before his death, he had stopped tobacco use. So when he got the opportunity to be Nepal's Minister for Health and Population, despite odds, he made unprecedented progress to advance health promotion, in particular, tobacco control. "121,000 people die every year due to tobacco in Nepal. Government supports patients of NCDs but this support is not enough. Moreover, prevention is better than cure" stressed Adhikari. He rightly says that "We should not have had to establish more hospitals" if health promotion was on track, because over 70% deaths are due to NCDs, a majority of which are preventable. He advocates for raising awareness to establish more stadiums and other spaces for increasing physical activity, and thereby reduce risk of NCDs. He also emphasized on critical need to reach out to the children and young people, so that they do not choose tobacco, but choose health and life. Also young people can help convince their family members and friends to stop using tobacco for their own health and wellbeing. MP Khagaraj Adhikari said that after 20 years Nepal has local bodies elected so it is an important opportunity to engage with local leaders to advance health and development at ground level. Hope 2019 and beyond will see these promises translate into firm public health and sustainable development outcomes.